Creative Crafts for Critters has 22 easy crafts children can make for their pets. No pet "furred, finned, or feathered" is overlooked in this delightful collection of treats, toys, and grooming aids. What cat could resist a catnip garden of his own, and can you name a fish that wouldn’t enjoy a fresh supply of earthworms? This craft book has everything a pet lover and pet could wish for: from a Biscuit Frame for treasured pet pictures to Party Animal Snacks. All the crafts use inexpensive, easy-to-find materials, and the instructions are presented in a clear, step-by-step format with illustrations children and adults will find both helpful and humorous. Included is a page of useful pet health and safety tips. From catnip toys to decorated collars and other ornaments, exercise toys, massaging mitts, and tasty treats, this book has something to please any furry, finned, or feathered friend. Most crafts are for dogs and cats, but pocket pets (small rodents) and birds are not ignored. A fun addition to pet or handicraft shelves. Want to get your hands and mind working? The following titles will get your family started. 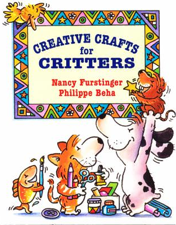 “Creative Crafts for Critters” by Nancy Furstinger (Stoddart Kids, 2001) offers 22 easy crafts you and your children can make for your pets. There are a variety of projects for all of your furred, feathered and finned friends. Pets are a major part of the lives of many people, not just children but adults as well. This book gives the reader instructions to make twenty-two craft-type projects that are sure to please a favorite pet. The instructions are clear and precise, so projects can be accomplished in a few hours. These would make fun gifts for kids to make for their own or other people's pets. If you take Fido shopping, this is definitely an item he will bring home for you to try. This is a really unique little book, which has a table of contents with twenty-two neat toys that can be made for all kinds of imaginable pets from dogs and cats to hamsters and budgies. At the end of the book the author has added a page entitled, "Pet Care Tips,"--this section is very nice to have as it reminds children that their pets are important and deserve their best care.